If you missed the Kickstarter and would like a book of your own, check out the shop! And another thanks to all our amazing backers – your goodies will arrive shortly, if they haven’t already! One of the few downsides to kickstarter is that it’s basically an agreement to hold yourself hostage doing some pretty extraneous stuff in order to get the thing you’re actually doing funded. The only bigger one in my mind is the whole “We’re going to take highly speculative venture capitalism and treat it like it’s functionally guaranteed.” I trust Brennan, Molly, and Griffen just as much as I trust Lavar Burton, but at some point some very big kick is going to fall apart and there will be a lot of very, very sad people. Aww. Well, good luck, and see you Tuesday. Got my book last week. Looks great, looking forward to the next one. And so, I’m at the latest page. Love the comic guys! This is by far the best superhero comic I have ever read. Granted, it’s not really my preferred genre, but if it was written like this one It probably could be. Next page is going to be Alison waking up to a Terminator future. I just know it. Put some shoes on Allison, your feet stink! 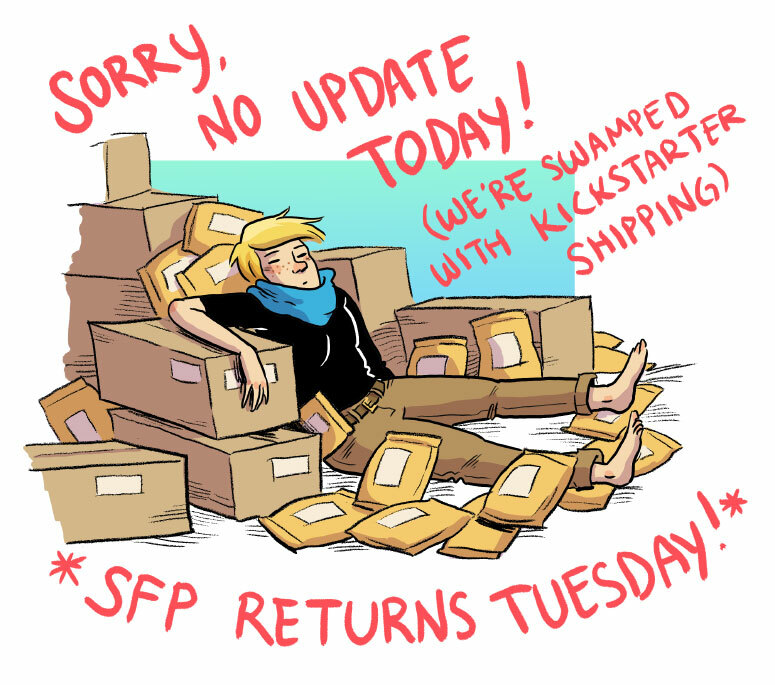 “Kickstarter shipping”? Who are you shipping it with?